Apps that Can Help You Find Gold | Where to Sell Gold | Will You Get Rich? The gold pan is the most necessary tool for new prospectors and well seasoned old pros. It's the first and the last tool used in gold prospecting. It helps to locate gold deposits and to check the value of gold ore being processed. Older gold pans were produced by machines from metal or fashioned by hand from wood or even cow horns. Modern pans are made from metal or, more recently, from plastic. A typical pan, two to three inches deep, measures from about a foot, to a foot and a half in diameter at the top, and several inches less in diameter at the bottom. I favor the plastic pan, because it is rust and corrosion proof. 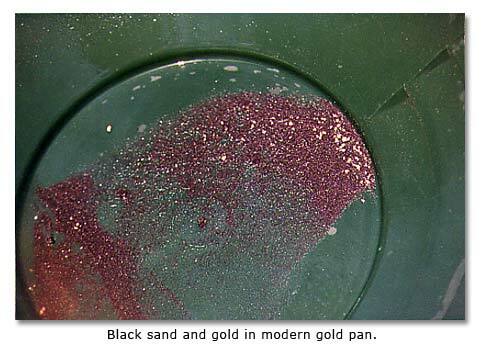 Plastic gold pans are about a quarter of the weight of a steel one, and the color can be black or green so that even the tiniest flakes of gold can be seen. Some old timers still use the metal pans. It's important to note that suction dredging has been banned in California since 2009. 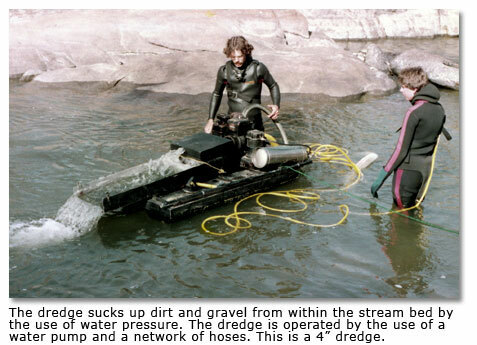 The use of any motorized vacuum or suction dredge equipment as part of a mining operation in any river, stream, or lake is currently prohibited in California. Dredging rivers for gold has consequently not occurred for the last eight years. The severe drought of 2014 has exposed gold areas that were below water in previous years. As water levels continue to drop, more nooks and crannies have become easier for gold hunters to access. Now is a great time to be out there panning for gold. The rain in 2017 move a lot of gold down river, once the water slow down lot of gold should be found. Gold pans are used to separate heavier material from lighter material. Gold is very heavy and sinks to the bottom of the pan. When panning, you wash away or remove the lighter material. The water in the pan allows the gold to sink to the bottom of the pan and separate from the rest of the content. "The material to be panned should be as uniform in size as possible. Panning is best done in a pool of still, clear water. First, fill the pan one-half to three-fourths full of ore or concentrate. Add water to the pan or carefully hold the pan under water and mix and knead the material by hand, carefully breaking up lumps of clay and washing any rocks present. Fill the pan with water (if not held underwater) and carefully remove rocks and pebbles, checking them before discarding. "Tilt the pan slightly away and shake vigorously from side to side with a circular motion while holding it just below the surface of the water. Removal of lighter material is facilitated by gently raising and lowering the lip of the pan in and out of the water. The pan may be periodically lifted from the water and shaken vigorously with the same circular motion to help concentrate materials. "Large pebbles should be periodically removed by hand. Panning continues until only the heaviest material remains. Gold may be observed by gently swirling the concentrate into a crescent in the bottom of the pan. Coarse nuggets are removed by hand, while finer grained gold may be recovered with a small suction cup. An experienced panner can process one-half to three-quarters of a cubic yard in 10 hours." 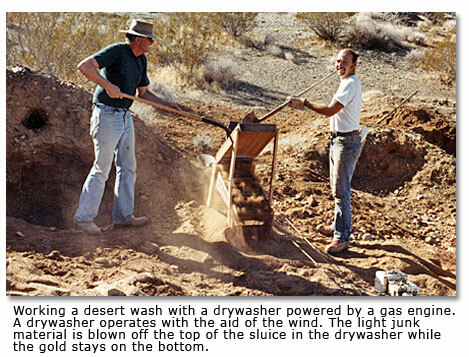 In addition to using a pan to work stream deposits, some prospectors employ equipment such as a rocker, which is a box-like structure equipped with screens for sorting gold from stream deposits; a shaking table, which is a motor-driven flat structure with riffles for separating gold from the deposits; or a sluice, which is a channel structure lined with riffles to separate the metal. Suction dredging has been banned in California. If you are an aspiring prospector, you might consider first exploring public lands under the jurisdiction of the U. S. Department of Agriculture’s Forest Service or the U. S. Department of Interior’s Bureau of Land Management. You will, of course, have to contact the agencies for information about authorized prospecting areas and governing rules and regulations in the area where you wish to work. Have a smartphone? The modern gold hunter has some new tools -- apps. Here are some that will tell you where gold has been found in the past. Where To Find Gold is an iPhone app which allows users to find locations for gold, silver, platinum and gems and to view them on a map. This app draws on a global database with more than 100,000 locations! The app also provides access to additional details for each location. See where people have found gold before and where the mines are located. Also check out the Digger's Map app for iPhone. For Android Phones, try the Gold Prospecting Tools app. It shows a real-time map, with current and previous tracks, to help you explore new areas and find more gold. All data is stored on the phone and displayed using the Google Maps V2 API. Where Can You Sell Gold? Numerous companies can be found on the internet in the U.S., Australia, Thailand, Zambia, South Korea, Nigeria, Ghana and others, who purport to buy gold. Unfortunately, as one company said, “There is a very high amount of fraud in this industry.” That suggests that one should check references and recommendations very carefully before committing to a sale to anyone. The price you would receive from a reputable buyer for your gold is based not only on the prevailing price at the time, but also on its purity. Although the search is inevitably exciting, getting rich won’t be easy. 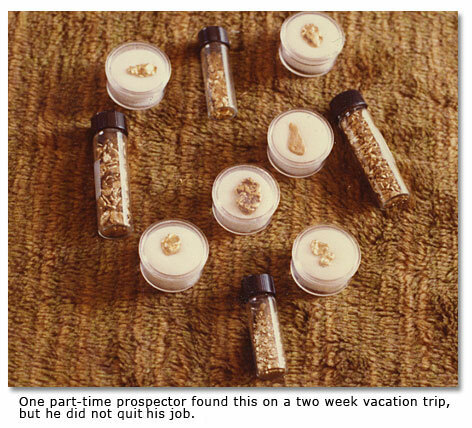 “Many believe that it is possible to make wages or better by panning gold in the streams of the West, particularly in regions where placer mining formerly flourished,” Harold Kirkemo said in a U. S. Geological Survey paper called “Prospecting for Gold in the United States.” Gold is, after all, trading at 1211.00 per ounce as of 7/7/ 2017. “However,” said Kirkemo, “most placer deposits have been thoroughly reworked at least twicefirst by Chinese laborers, who arrived soon after the initial boom periods and recovered gold from the lower grade deposits and tailings left by the first miners, and later by itinerant miners during the 1930’s.” Modern investigations by geologists suggest that “few, if any, recognizable surface indications of metal-bearing deposits were overlooked by the earlier miners and prospectors,” even in the most remote regions. Most successful gold mining enterprises in the Southwest lie in the hands of large companies, who have the capital and technology to profitably recover and process even low-grade ore. 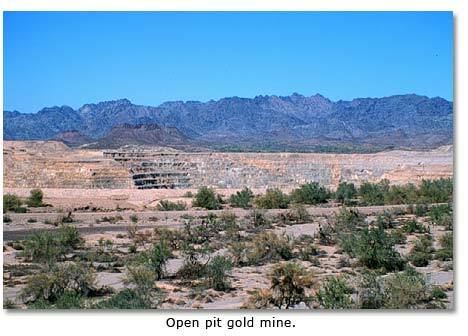 Nevertheless, Kirkemo said, “Some degree of success in finding gold still remains for those choosing favorable areas after a carefully study of mining records and the geology of the mining districts...” Additionally, technology, for instance, metal detectors, gives modern prospectors an advantage over their predecessors.